K. Vikram Rastogi, a postgraduate engineer, is a multifarious task-master as Teacher, Stone & Architecture Journalist, Educationist, Consultant, Trainer and a Book Writer. He is presently the President of Stone Technology Centre Group (widely known as STC Group), Jaipur, and has worked as Training Service Provider at Stone Artisan Park Training Institutes (SAPTIs.) at Ambaji and Dhrangadhra in Gujarat (a skill development training programme in stone sector sponsored by Government of Gujarat) for about five years. He has rendered a dedicated service of more than four and half decades in different fields with three and half decades in stone industry alone. He started his career as an Associate Lecturer in erstwhile Malaviya Regional Engineering College, Jaipur (now MNIT, Jaipur) in 1967 and taught graduates and post graduates in Mechanical Engineering for 11 years. He then diversified to stone industry and worked with Government Corporations involved in stone mining and processing and then started working independently by setting up a concern catering to the requirement of all facets of the stone industry – publication, consultancy, conducting pre-feasibility and feasibility studies for setting of stone mining and processing industries, setting of institutions, conducting training courses, organizing workshops and seminars etc. He has been trained abroad in installation, commissioning and maintenance of granite gang-saw, polishing and edge cutting machines. He has supervised installation of a complete imported granite processing plant and operated to produce granite slabs. He has also worked as a consultant for installation, commissioning and production of other stone working machines. He worked as consultant with Commonwealth Secretariat, London, for implementation of their marble and granite projects in the countries of Africa, Pacific, Caribbean and Far-East Regions. A feasibility study was prepared for implementation of a slate project in Bhutan for UNIDO. He has been associated with the development of `Shaktisthal’(An Open Geological Garden) in New Delhi, the Samadhi of Mrs. Indira Gandhi, Former Prime Minister of India. He has prepared Project Reports for setting up Centre for Development of Stones in Jaipur, India and a Marble Technical Institute in a South Asian Country. He contributed significantly in drafting of Project Report for setting up of International Stone Research Centre (ISRC) in Gujarat. He successfully conducted various vocational skill development training programme of one week, three-four month (two courses) and one year course in stone sector for school pass outs/drop outs in two state-of-art institutes –Stone Artisan Park Training Institutes (SAPTIs.) set up by the Government of Gujarat at Dhrangadhra and Ambaji for almost five years and secured jobs for passed out trainee students in Gujarat and others states of the country. A project for Study and Development of Improved Tool Kits for Stone Craft Artisans of Varanasi, Uttar Pradesh, was completed for National Centre for Design and Product Development, New Delhi, an Enterprise of Government of India (Ministry of Textiles). K. Vikram Rastogi has recently been appointed as Chairman of Institute Managing Committee (IMC) of Government ITI, Amer (near Jaipur) by the Government of Rajasthan. IMC would be carrying out various training courses mainly related to stone and construction activities in GITI campus in addition to the existing courses. The IMC exercises full autonomy to conduct any course. He is also involved in construction related activities in India and abroad. K. Vikram Rastogi maintains the distinction of having visited more than 44 countries with more than 120 visits and has attended almost all important natural stone fairs held all over the world; Marmomac Verona and Carrara Marmotec, Carrara, in Italy; MARBLE, Izmir, Turkey; Stone+tec, Nuremberg, Germany; Stonetech, Beijing/Shanghai and Xiamen Stone Fair, Xiamen in China etc. are a few to be named. As a writer and an expert in stone & architecture, his achievements are remarkable. He has written seven books on Dimension Stones, has authored and presented many papers in national and international journals/conferences. His international recognition as an acumen in stone, architecture and training is evident from the fact that he was invited to present technical papers as Key Note Speaker/Speaker (including chairing of Technical Session) in international forums - Global Stone Technology Forum, at Jaipur; V. Global Stone Congress at Antalya, Turkey; Congress For Stone Design & Building Technology held during MS Africa in Cairo, Egypt; World Stone Congress at Xiamen Stone Fair, 2015 in Xiamen, China; two technical papers in Middle East Stone Show Educational Programme at Dubai, UAE; First Annual Construction Research Conference and Exhibition (ACoRCE) in Nairobi, Kenya; again at Global Stone Technology Forum (GSTF) held in Udaipur and Kishangarh and at India StoneMart 2017 (including chairing of a technical session) in Jaipur in the recent past. He had been invited to present a technical paper on “Emerging Markets” in World Stone Congress held in Xiamen, China, in 2017 and “Skill Development Training in Stone Sector in India” in MERSEM 2017 from 13 to 15th December, 2017 in Antalya, Turkey. He has been invited to present two papers in Global Stone Congress 2018 from 26-29 April, 2018 in ILHEUS (BAHIA), BRAZIL. Earlier, he chaired a technical session and was Key note speaker in another technical Session in India Stone Mart 2003 in Jaipur while he contributed as Co-Chairman of a technical session in Sandstone Spectrum 2003 in Jodhpur. He is also a known journalist in stone sector. He is Editor, Stone Panorama (the largest distributed stone magazine in Asia and third largest in the world) and Architecture and Interiors International Panorama, a leading quarterly magazine in architecture. K. Vikram Rastogi has Special Honours at national and international level. He was conferred the title of "di Cavaliere" by the administration of St. 'Ambrogio, Italy in 1983 and the Government of Rajasthan with "Certificate of Merit" on 26th January, 1988. 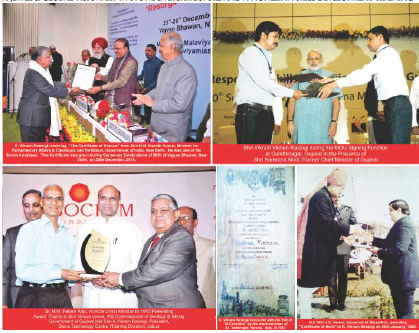 As Training Service Provider, was instrumental in securing first National Education Excellence Award 2013 of Government of India in association with ASSOCHAM for Best Government Initiative under Vocational & Skill Development Training. He was honoured with “Certificate of Honour” by Mahamana Malaviya Mission, New Delhi, on 25th December, 2016, the Centenary Celebration Day of BHU. The Certificate of Honour was presented jointly by Shri H.N. Ananth Kumar, Hon’ble Minister of Parliamentary Affairs and Chemicals & Fertilizers and Shri S.S. Ahluwalia, Minister of State for Agriculture and Farmers Welfare, Govt. of India. His areas of interest are: Education, Consultancy, Training and Publication in stone & construction sector at global level. K. Vikram Rastogi has become a legend in development of stone sector and is already a brand name not only in India but also abroad.